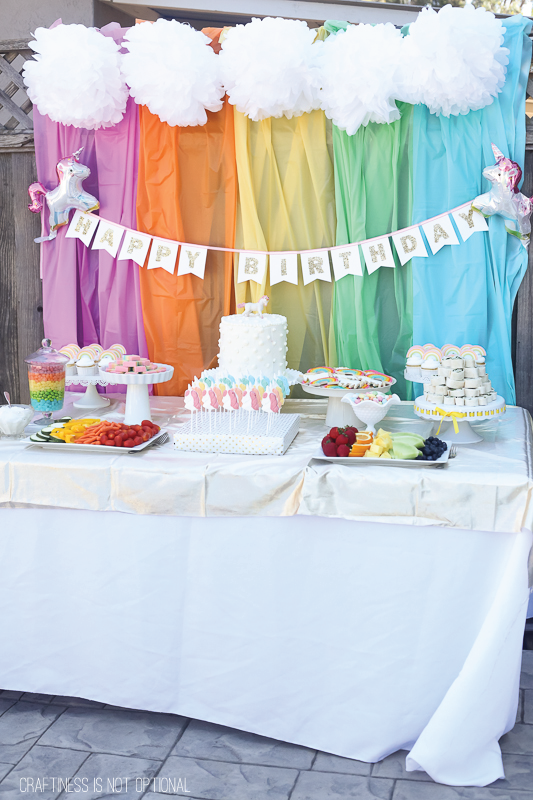 Charlotte is all about the sparkle right now, so a unicorn & rainbow party was right up her alley! 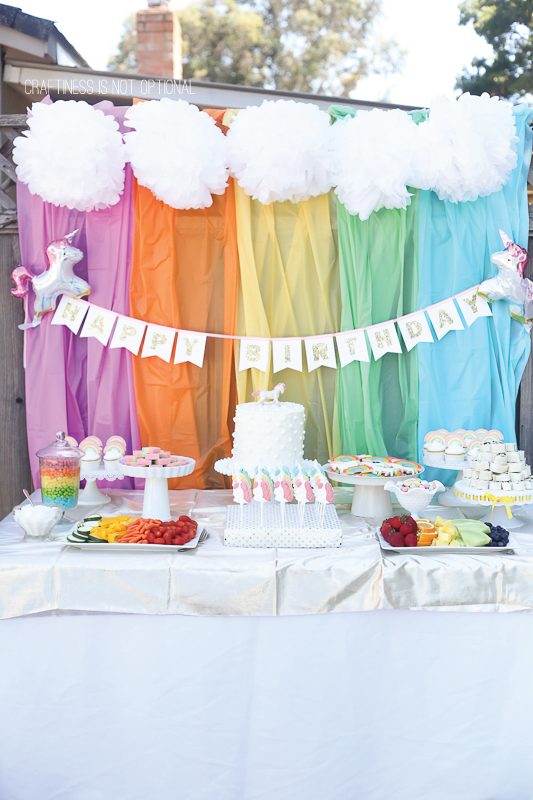 I went all out with the rainbow theme and created the backdrop for the table with cheap plastic tablecloths stapled to the fence, and added 5 white tissue poofs along the top for “clouds”. 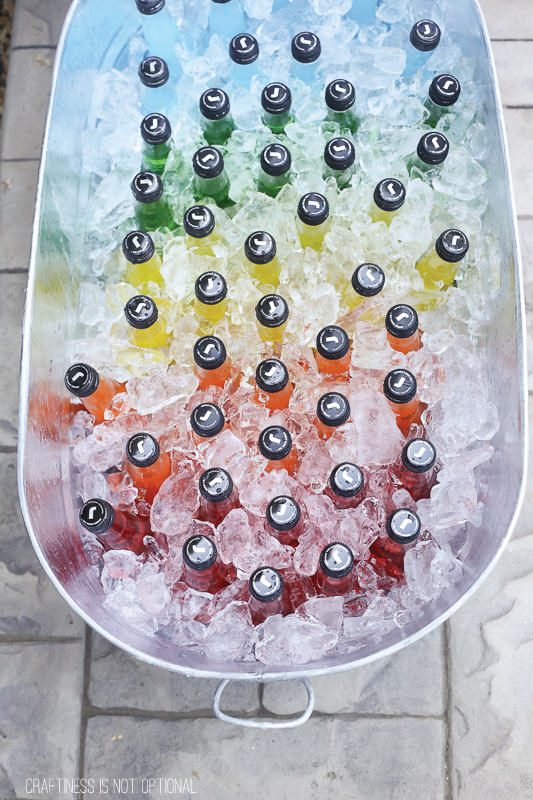 I had found an awesome deal on Zulily for Jones soda and I bought pink, orange, yellow, green, and blue sodas! 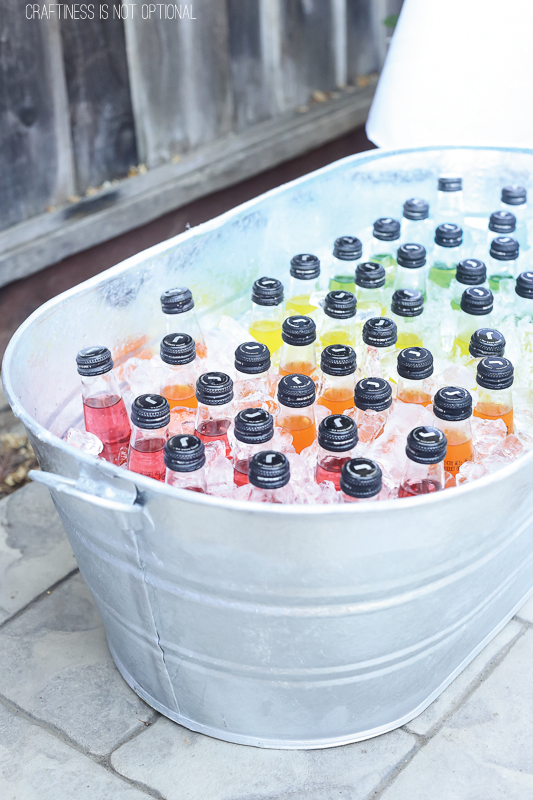 I wanted to line them up on a table but couldn’t think of a good way to chill them before the party, so we bought this large tub and filled it with the sodas and ice! They were delish! the Pineapple cream soda was a hit! 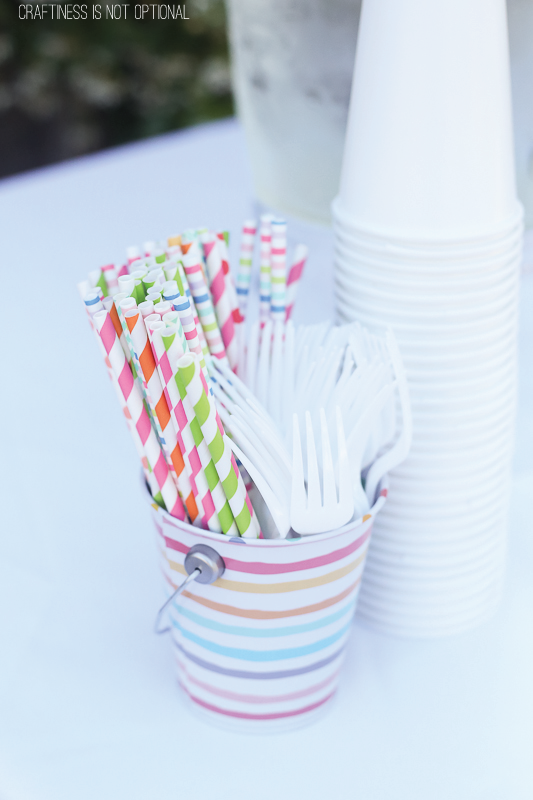 I raided my straw drawer (no seriously I have a drawer just for my paper straw collection) and grabbed all the brights that were leftover from other parties! Tin from Target. 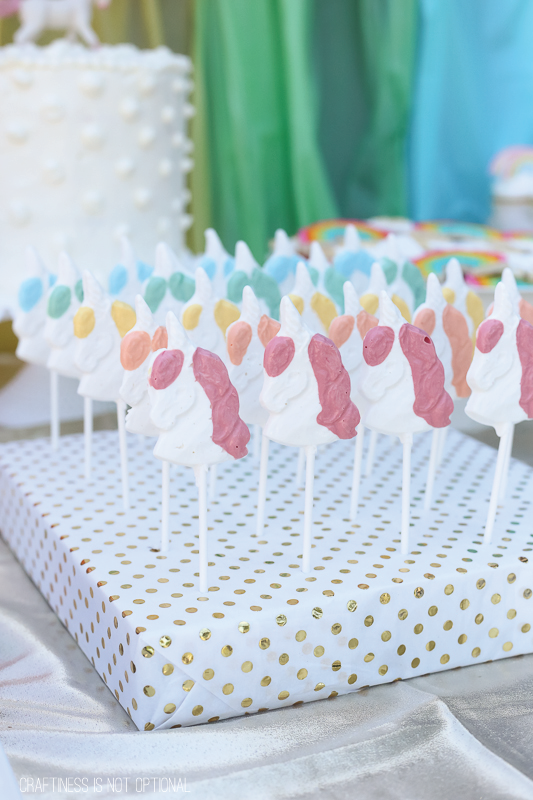 I made some white chocolate unicorn lollipops in rainbow colors of course, with this cute mold! 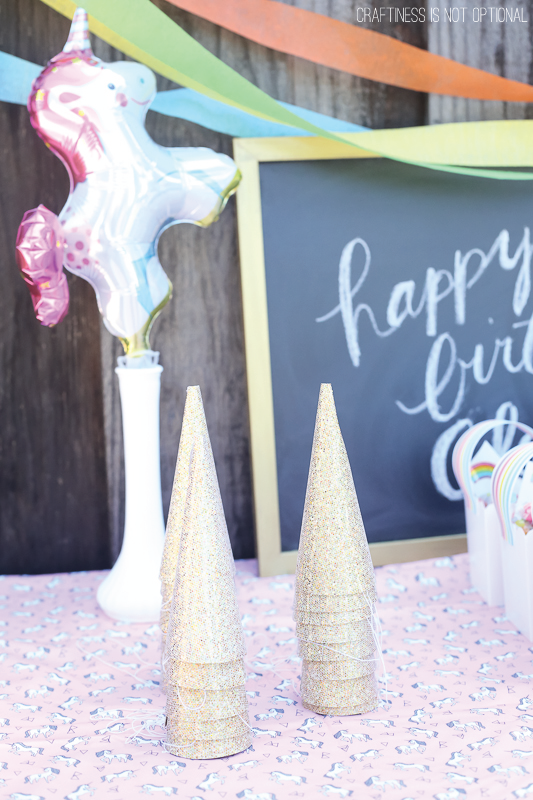 The stand was made with some craft foam taped together and wrapped with this gold polka dot tissue paper! 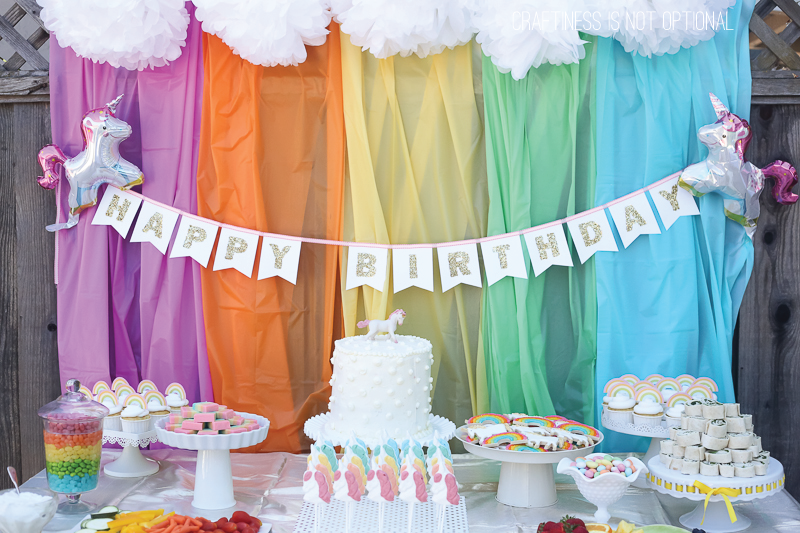 Perfect for swapping out the color/style to fit other party themes! 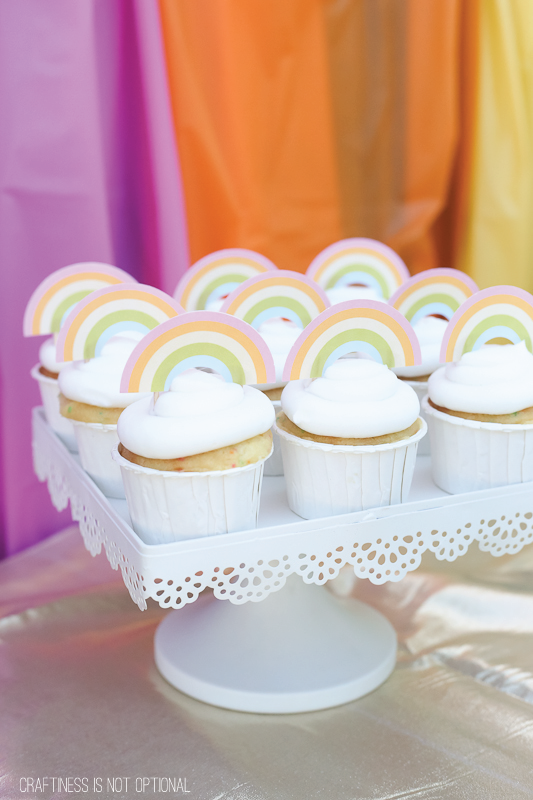 I made some rainbow chip cupcakes in these plain white cups and frosted them to look like clouds, then made some cupcake toppers with toothpicks and this FREE printable! the cute cake stand is from Pick Your Plum. 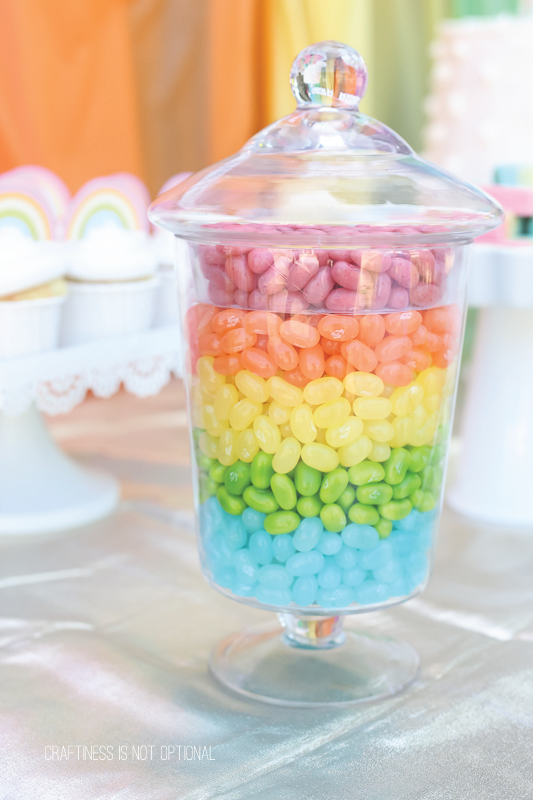 I layered some jelly belly beans in this glass container-I had to re pour them a few times cause the layers kept being uneven. and I’m insane. 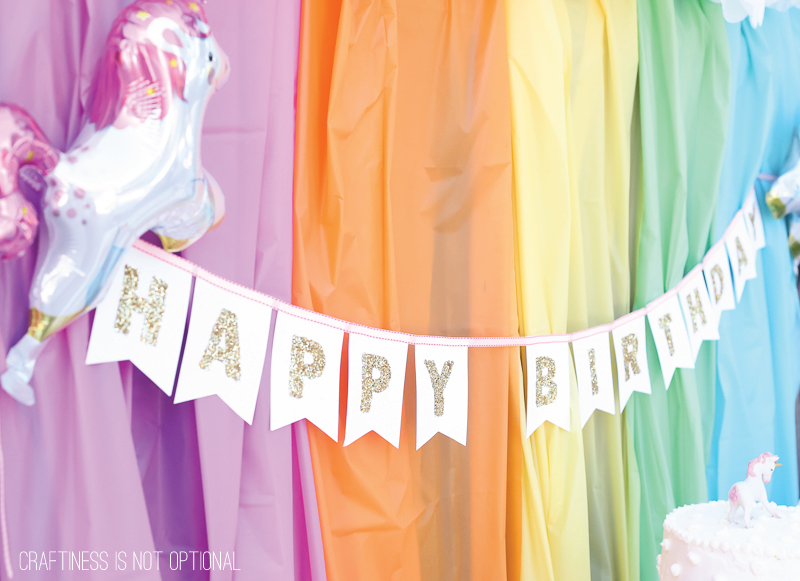 I grabbed some adorable mini unicorn balloons to “hold up” the Happy Birthday banner! 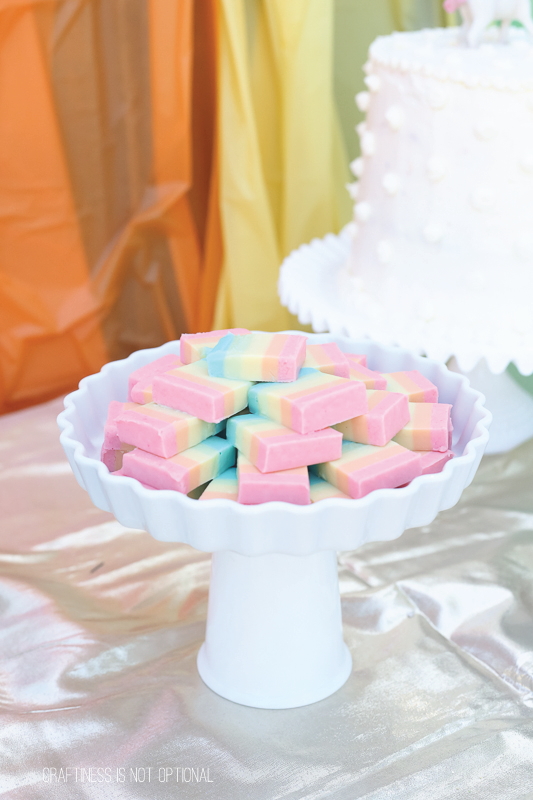 This layered rainbow fudge is seriously awesome looking! And besides the chill time between layers (in the freezer, about 10-15 min), it was a cinch to whip up! It tasted good too, I’m told! I’m just not a huge white chocolate fan. The cake! Didn’t turn out how I wanted to, outside at least…I wanted to ruffle-ize it, but I lost my ruffle tip that morning pretty sure Ava took it and thus I went with the simple dot look. still pretty cute, and Charlotte loved it which is what’s really important, right? 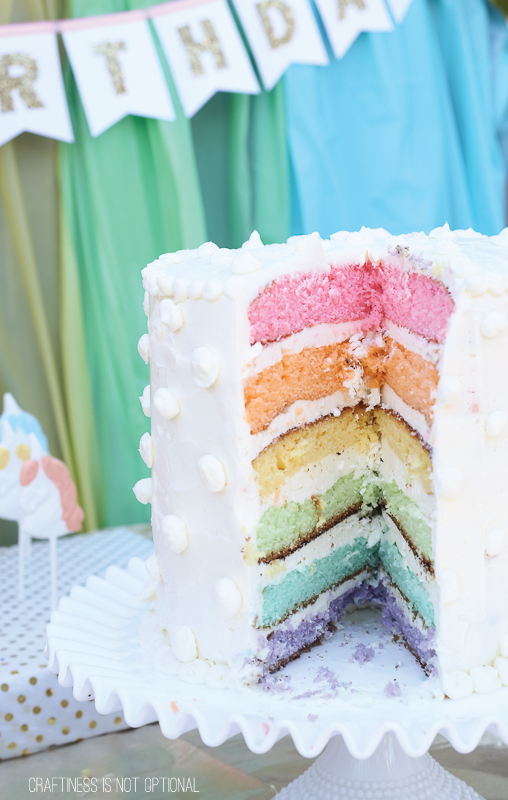 Inside: RAINBOW ALL THE CAKE. Also, a few of them were well done on the bottom…I should have cut the bottoms off…and rotated the cake pans while they were baking…but all in all, a win for rainbowtizing the cake! These cookies were SO fun to make and look at and mostly, Look at. I mean, how cute are those unicorns? (that’s gold luster dust painted on the horns, hoofs, manes, and tails!) the girls loved them and enjoyed watching the sprinkle dipping go down. I loved not having to tint and pipe so many colors! 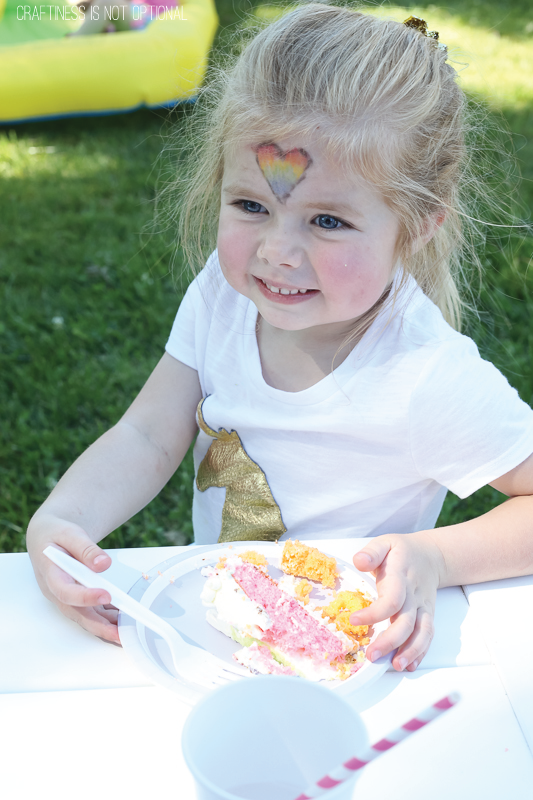 I seriously adored doing the rainbows with sprinkles….super easy! 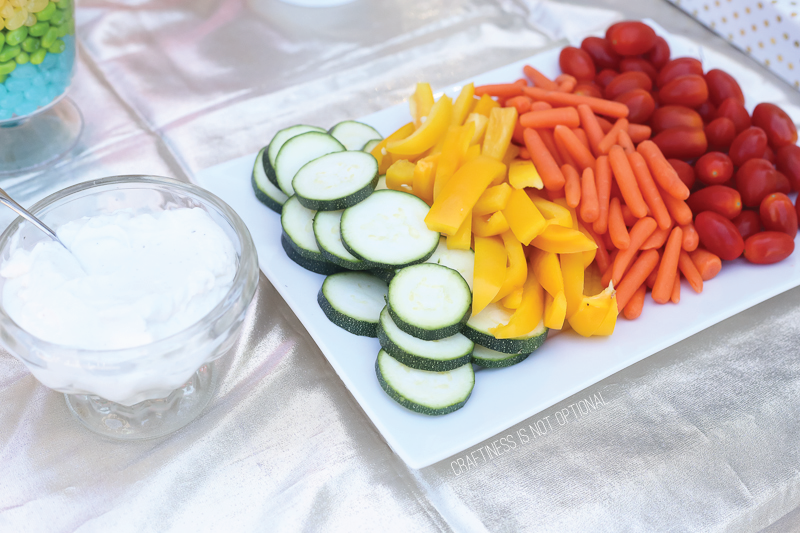 and rainbowtized veggies and dip as well! Charlotte had such a great time! She got to have a friend from preschool come and she felt so grown up about that! I can’t believe she’s going to be 5! You can see a sneak peek of her outfit in this pic…more on that later in the week! I made some gold glittered unicorn horns for the kids to wear! Quite a few adults wore them as well, including Rory…lol! I have a how to and template coming for these bad boys, too! 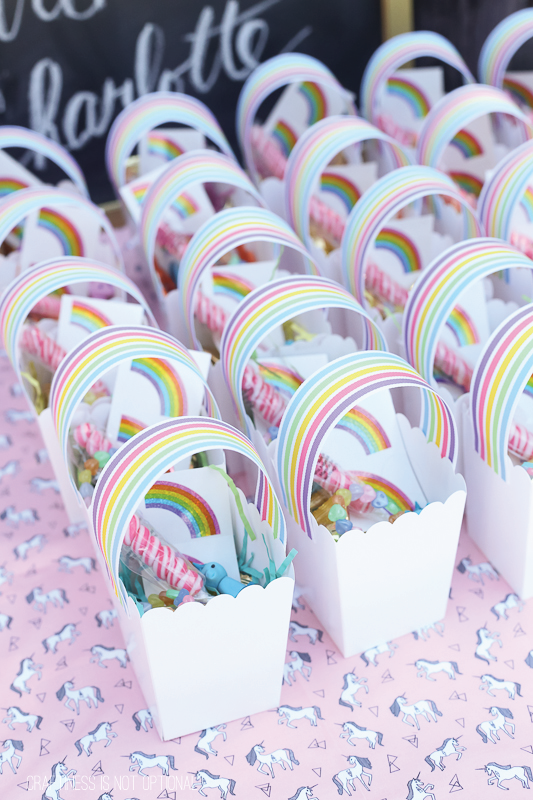 I made some “rainbow” favor boxes with white popcorn boxes and rainbow ribbon. I love how the boxes look like little clouds! I filled them with unicorn horn lollipops, gold wrapped mints, rainbow bracelets, unicorn erasers, and a few rainbow stickers! I also encouraged people to load their boxes with those jelly beans on their way out! We had a blast celebrating this sweet girl of ours! im officially feeling like the worst mother now!! What a fun party! 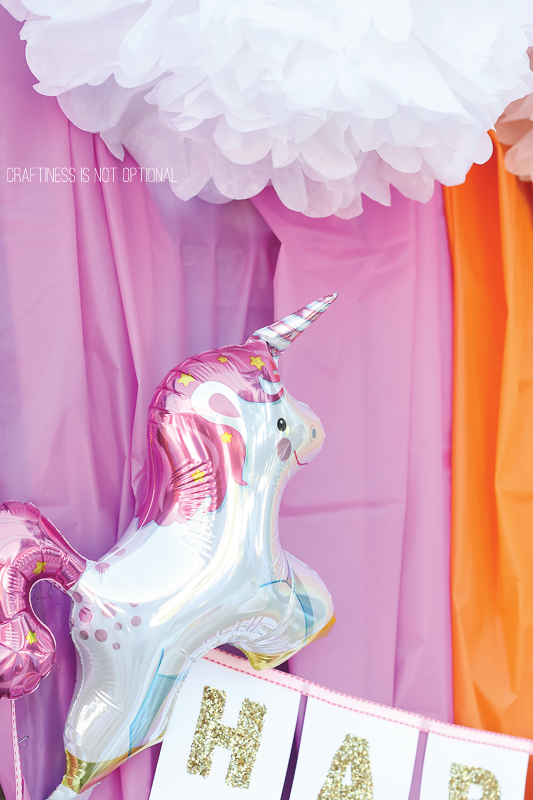 You always go a great job of parties and provide inspiration for my two girls! So pretty! Happy birthday Charlotte! 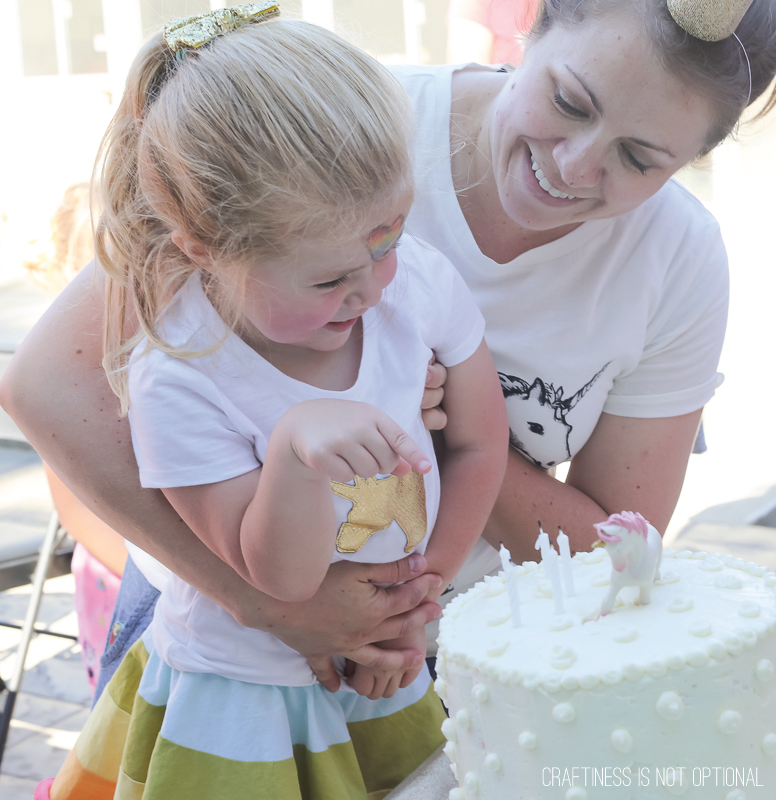 Your birthday parties are always so cute! Love it!! So cute! I hope you’ll be showing more of her adorable outfit! Wow. Your parties are always amazing. Just curious how long it takes you to do all the prep for these? months…I start planning months in advance and do all the prep in spurts so it doesn’t get too overwhelming, although the week of is pretty busy and the day of is hectic! I love it though! 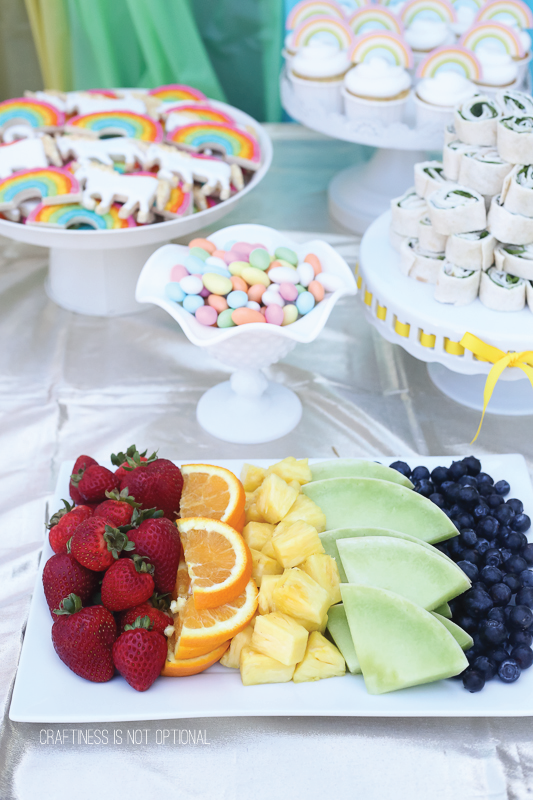 You, my dear, are crazy good at this party planning. My girls would die for a fraction of this party! Wow, this party is amazing! Rainbow perfection! Right on down to the fruits and veggies… love it! I don’t doubt for a minute that you really do have a straw drawer! I take my hat off to you, once again. You are truly the master of the all out girl’s dream party. 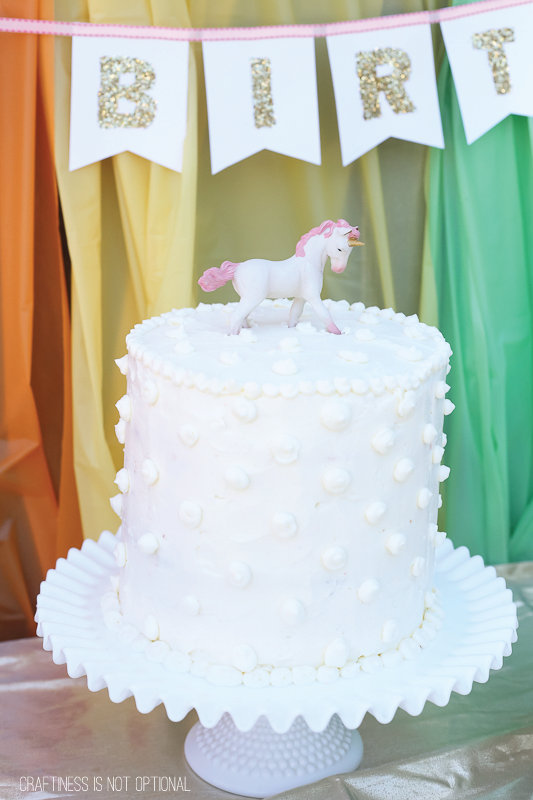 And I didn’t even know “rainbowtize” was a verb let alone how to apply it to a cake! 10/10 again!! I have a straw drawer too! But that, my dear, is where our party planning similarities end ;). We only do “big” parties every other year, and even then I have to keep them small for my sanity’s sake. In truth, I would love nothing more than to go all out and make it a huge event!!! Maybe when my girls are teenagers and they can actually help and also remember it ha ha! Holy moly. I love this so much. Way to go friend! i love this! 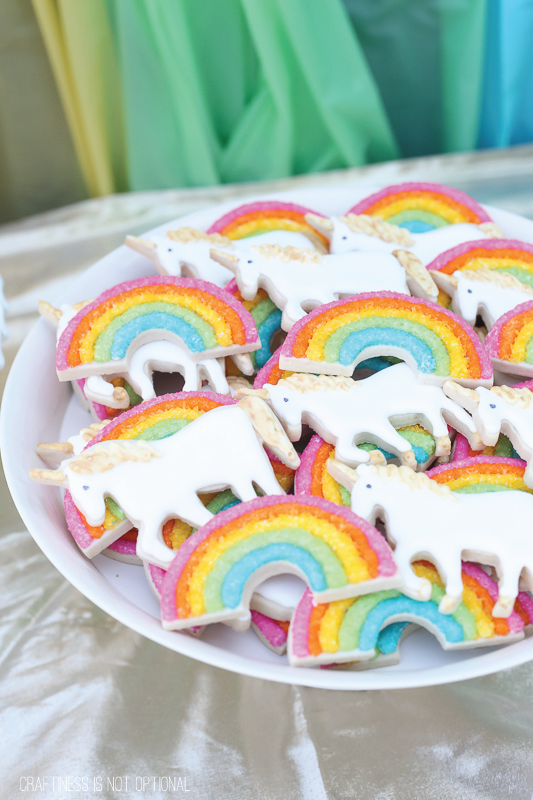 How did you make the rainbow cookies? Love this! 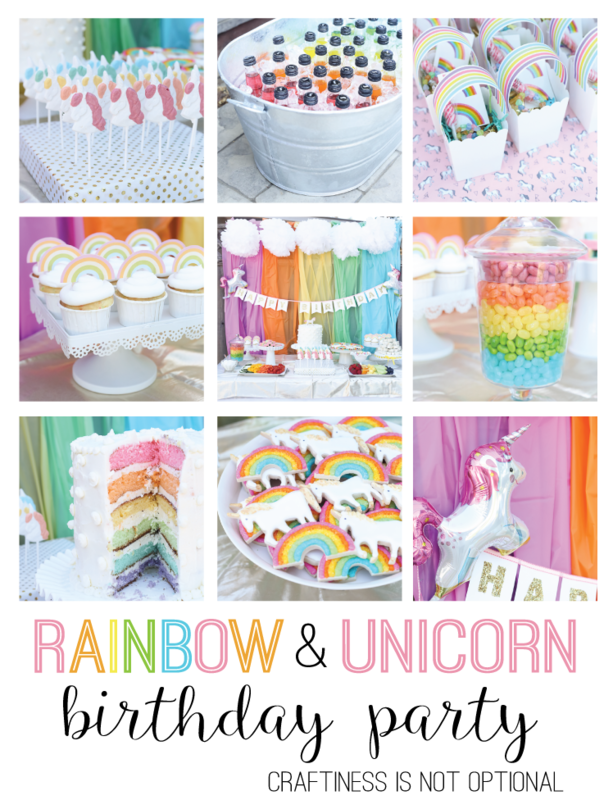 My daughter says a unicorn party is next for her so I would love the instructions for making the gold horns please! Beautiful party!! 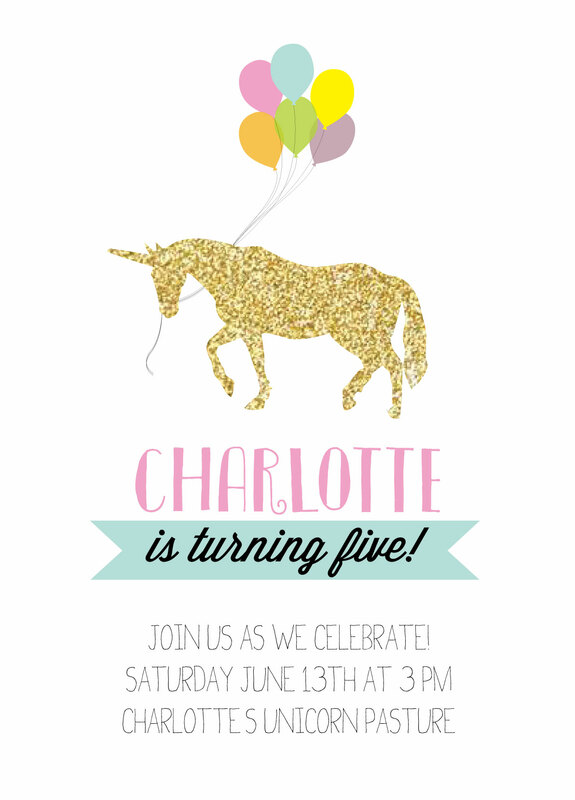 Do you have a template for the invitation that I could edit for my daughter? 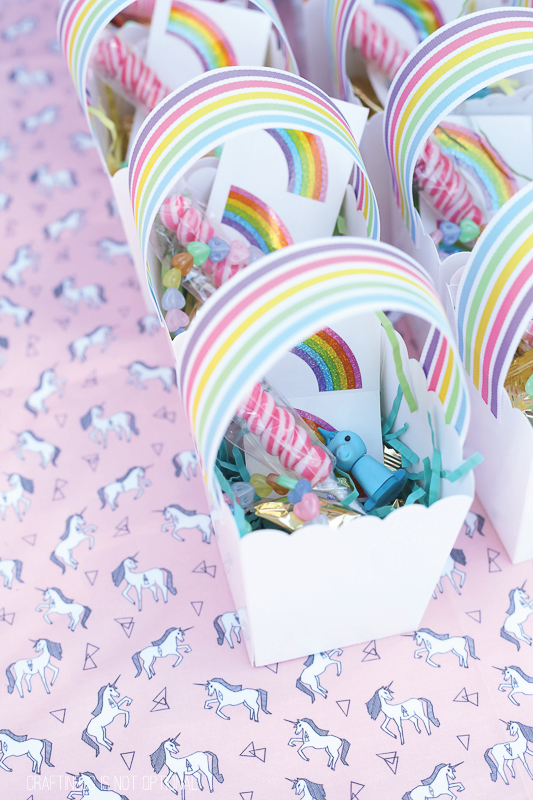 I like the pop corn boxes with the rain bow ribbon handle. What did you use to hold the ribbon in place?